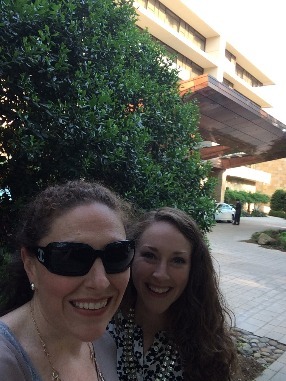 Last week my sister and I went to dinner at Herons at The Umstead in Cary. I had a giftcard, and was torn between pampering myself for a day at The Umstead's legendary spa, or indulging in a opulent 3 or 4 course meal at the 5 star Herons. The foodie in me won, and I called the one person I knew who would enjoy such a meal as much as I would, my sister Rachel. The meal that followed, to put it simply, was probably the best I've ever had (and I've eaten every single day of my almost 30 years-so that's a lot of meals). So without further adu, here is everything we ate (and we ate everything). For an amuse bouche, they brought us a goat cheese fried cake, topped with a bacon jam. I asked if I could take a bath in the bacon jam, unbelievable. It was served under a Beauty in the Beast style dome (you know the glass thing the Beast's rose was kept in). About this time they brought around a tray with sliced lemons, limes and cucumbers to compliment our water. Now, I'm a bread and butter girl (I mean I would be so happy to eat nothing but bread and butter for a week, or more...) and this blew me away. A butter trio, first a truffle butter, next a classic salted butter and finally (my personal favorite) lemon thyme butter. 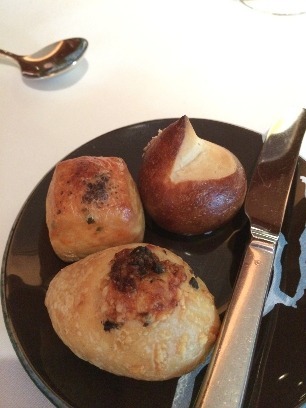 To accompany the succulent butters, 3 breads of course. These were presented on a tray and we were allowed to pick any and all varieties we wanted to try (um..all of course, and I may or may not have gotten seconds). The first (closest to the front) was a chibatta roll with porchini mushroom and cheese (can't remember what kind). The second was a cheese and onion or herb flakey biscuit (sorry you put bread in front of me and I no longer can hear what is being said to me), and finally a pretzel roll. The cheesy, herb biscuit was my favorite, my mouth is watering as I type about it topped with the lemon and thyme butter, more please. Next was the first course, and according to the menu this is, Violet Potato Soup with caviar, lemon, bulgar wheat, brown butter and white chocolate (the waiter said there was an asparagus puree in here as well). This sounded to bizarre and unique not to try. My mouth has never tasted such flavors, slightly sweet, with pops of salty tang, and crunchy bites of toasted nuts. As a picky eater, needless to say I was scared when I ordered this, but it was phenomenal, and it was the most beautiful presentation of soup, ever. Then the main course was served, I ordered beef tenderloin with black garlic, twice baked espresso potato, fava beans and port. First, the steak was cooked perfectly, and the port glaze was amazing.The espresso potato's were creamy tasting mashed potatoes, with a bitter, rich note of espresso (again totally unexpected and delicious). 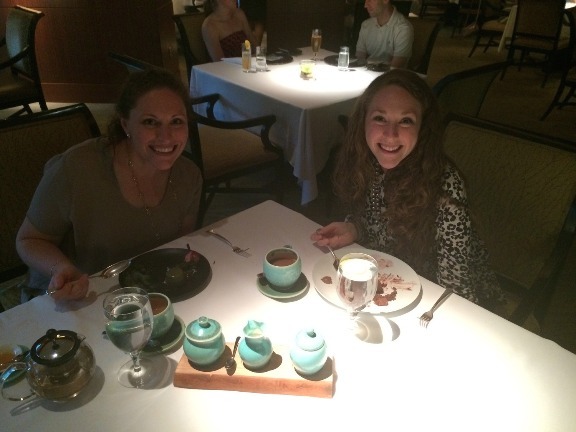 Me and Rachel both tried the scored brown circles, and we debated whether it was pork belly, or scallops or what? We had to ask the waiter, and to our shock it was parsnips! Parsnips? It tasted smokey like bacon, and chewy like a scallop, and this was a root vegetable?! Mind blown (yet again). Rachel ordered cedar grilled wild salmon with brioche, watercress and fennel-bacon jam. As you can see a thin layer of brioche bread was painted on top of the salmon (some kind of magic must have been involved in the preperation). I got to try a bite, and it was so moist and flavorful and the thin buttery crunch of the brioche really made it exquisite. After dinner a palate cleanser was served (just like in The Princess Diaries). 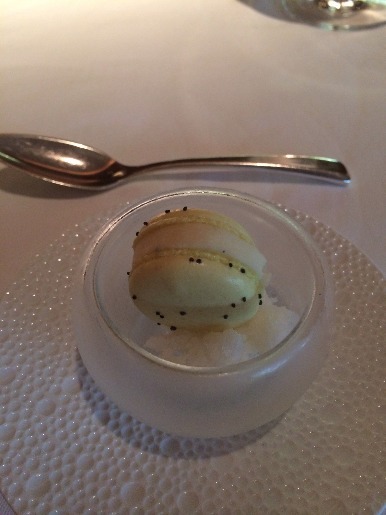 It was a lemon macaroon, with a chamomile cream filling served over lemon verbena ice. One of the things I wanted to do before I turned 30, was try a macaroon, mission accomplished. Again, like nothing I've never tasted before, so light yet incredibly flavorful with just enough sweet. 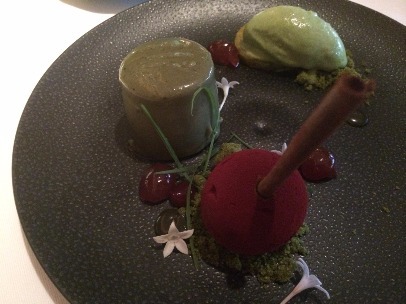 For dessert I ordered Sakura Green Tea with pistachio biscuit, sour cherry, cherry blossom gelato and anisette gel. Ok, so honestly, when I read that on the menu, I had no idea what any of that meant, but thanks to the guidance of our waiter basically it was a cherry, pistachio and green tea mouse, ice cream delight. 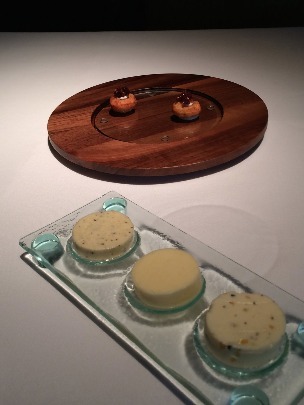 The biscuit and ice cream was by far my favorite, the anisette gel, I mean, I don't even know how one would make that, my mouth was delighted they did though. 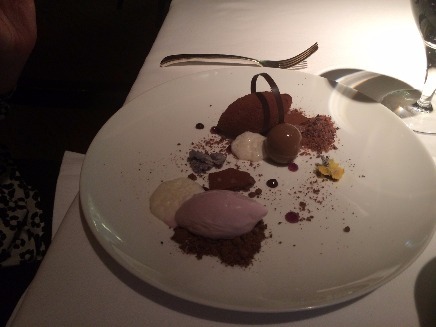 Finally the cherry mouse with chocolate stick, was a light and fluffy way to end this dessert trio. 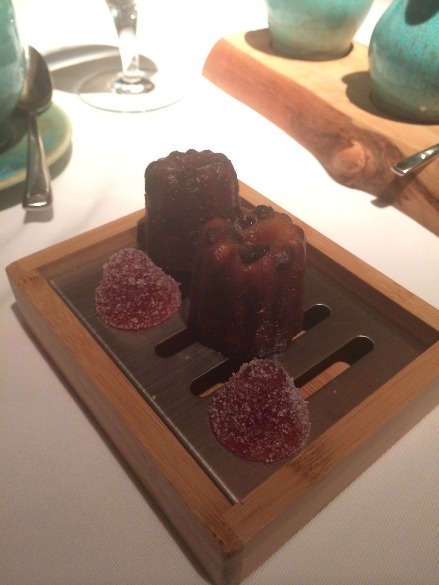 To the creator of this dessert, one word comes to mind, genius. Rachel, the chocolate lover, ordered Videri chocolate cremeux with coffee custard, cappuccino foam, dehydrated mouse, violet gelato. 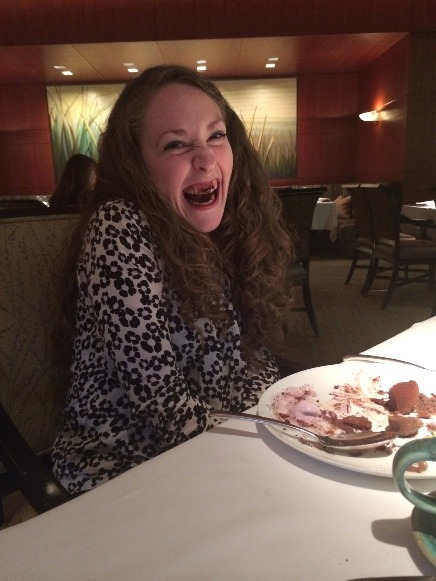 I only got one tiny bite of the chocolate cremeux, and wow it was the most chocolately tasting bite I've ever had, and guessing by the looks on Rachel's face, it was just as delicious as mine. The architectural plating was a feast for the eyes, before your mouth had it's turn. Superior in beauty and flavor. Also, this happened...we are so fancy. Our finale treat for the night was an moist and eggy chocolate mini bundt cake, with a currant fruit chew. Both Rachel and I agreed this really brought our palate back to normal, and was the perfect morsel to end a flawless meal. Also, I wish the currant fruit chews were sold in a large bag as I could munch on these all evening. I now know what it's like to eat and be treated like a princess (and Kate I'm jealous). 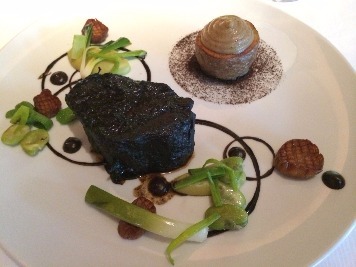 This meal was a phenonimal experience that everyone should have at least once in their lives. To eat food that is also art, to try flavors and textures that your mouth has never experienced, to be waited on by a staff that will treat you as if you wore a tiara for your day job. I would like to go to summer camp at Heron's and just watch the creative process behind these dishes, to watch culinary genius at work. 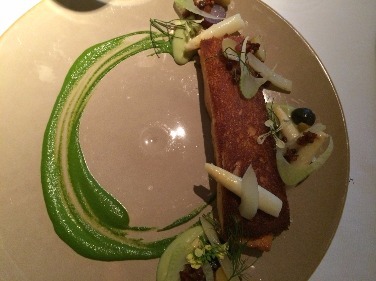 At least once in your life treat yourself to a meal at a 5 star restaurant, believe me you will be surprised at the flavors and textures you will be exposed too because, where there's a meal, there's a way!